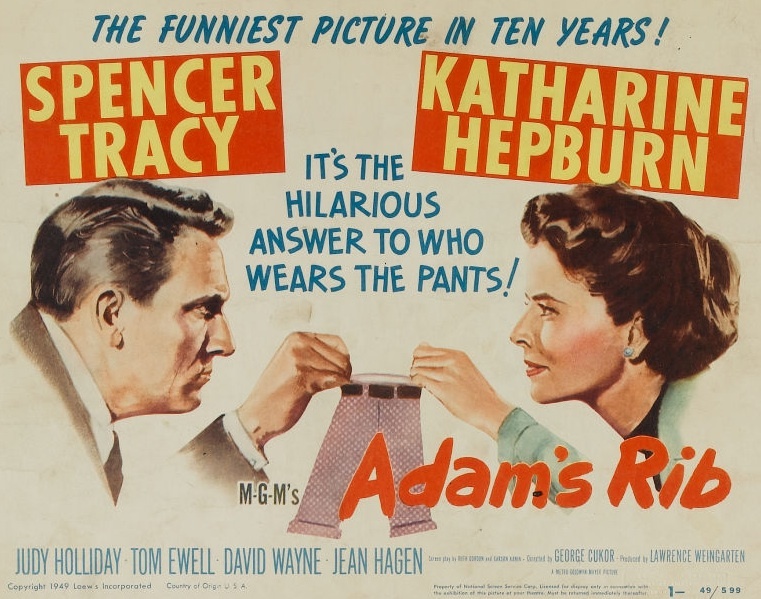 I haven’t seen all the movies Katharine Hepburn and Spencer Tracy made together, but of the ones I have seen, Adam’s Rib is easily my favorite. It’s hard to imagine a better vehicle for their talents. 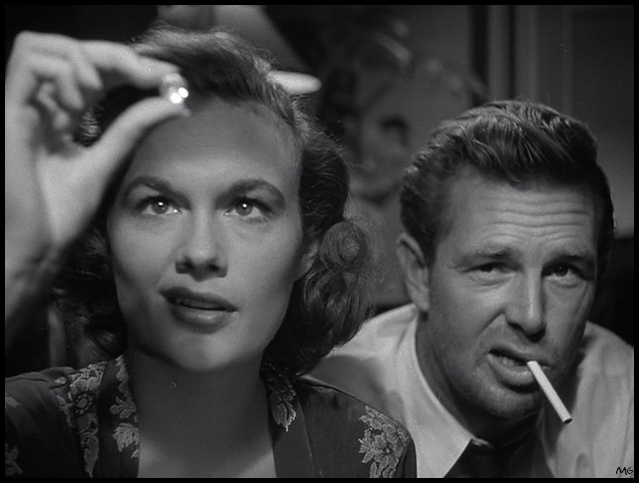 Before Adam’s Rib, Hepburn and Tracy had appeared together in George Stevens’s Woman of the Year (1942), George Cukor’s Keeper of the Flame (1942), Harold S. Bucquet’s Without Love (1945), Elia Kazan’s The Sea of Grass (1947), and Frank Capra’s State of the Union (1948). 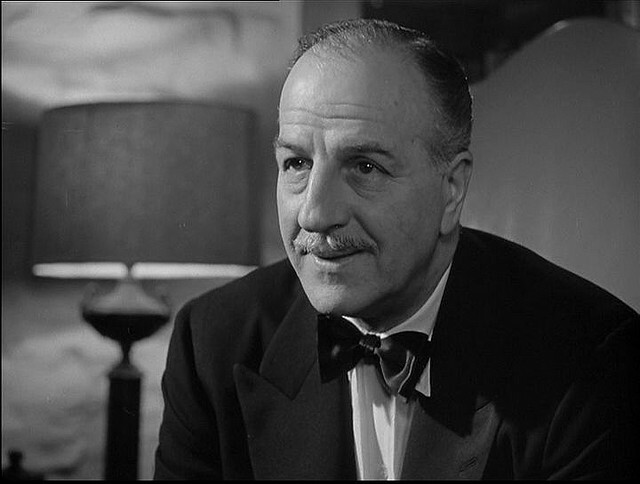 The director of Adam’s Rib, George Cukor, directed one of my favorite films from 1947, A Double Life. He is probably most famous for directing The Philadelphia Story (1940), which starred Katharine Hepburn, Cary Grant, and James Stewart. I loved A Double Life, but it’s a dark psychological drama about murder and madness, and couldn’t be more different from Adam’s Rib, which is an effervescent comedy, so it was fun to see the same writers and director making an equally good film about a completely different subject. Adam’s Rib is not just a yuk-fest. While I laughed a lot, its take on gender relations is thought-provoking stuff; not only because it’s so different from most other Hollywood movies of the time, but because so much of it is still relevant. Society may be less forgiving of male infidelity nowadays, but double standards are still rife. 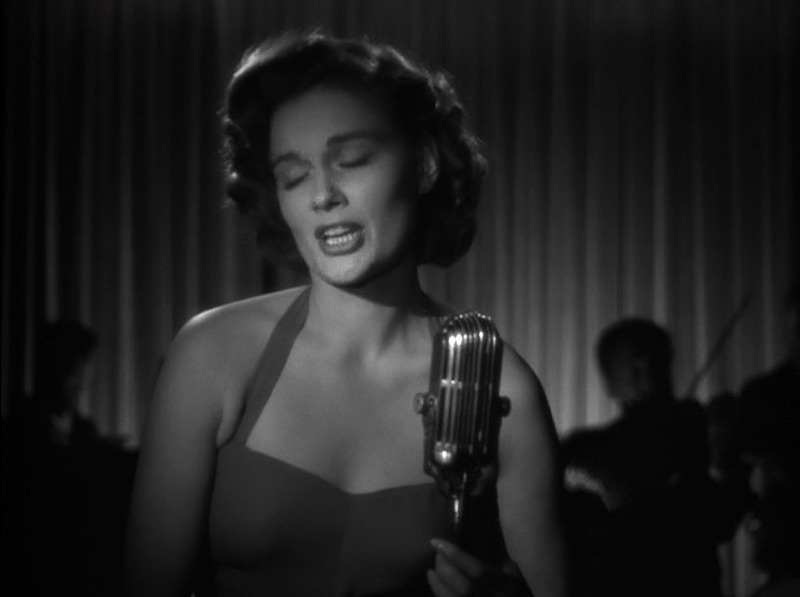 There’s a great scene early in the film in which Amanda Bonner asks her secretary, Grace (Eve March), why infidelity is “not nice” if it’s a man stepping out but “something terrible” if a woman does it. The acknowledgement that we are all complicit in creating standards of “male” and “female” behavior is rare in motion pictures today, and was even rarer mid-century. 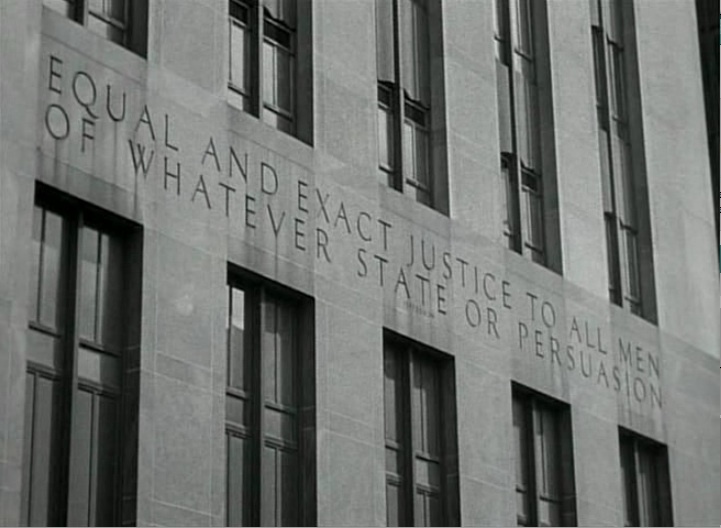 I also loved all the subtle bits in the film, like when a shot of the exterior of the courthouse implies that Amanda Bonner’s client may not — as a woman — get a fair trial. The woman in question is Doris Attinger (Judy Holliday), a ditzy simpleton who emptied a revolver in the general direction of her husband, Warren Attinger (Tom Ewell), and her husband’s mistress, Beryl Caighn (Jean Hagen). She wounded her husband, and is on trial for attempted murder. 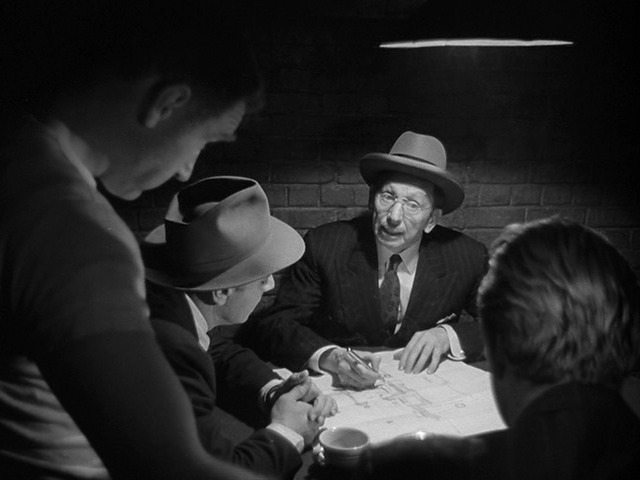 Assistant District Attorney Adam Bonner pulls the case and prepares to prosecute Mrs. Attinger, but his wife, Amanda Bonner, begins to needle him about the specifics. 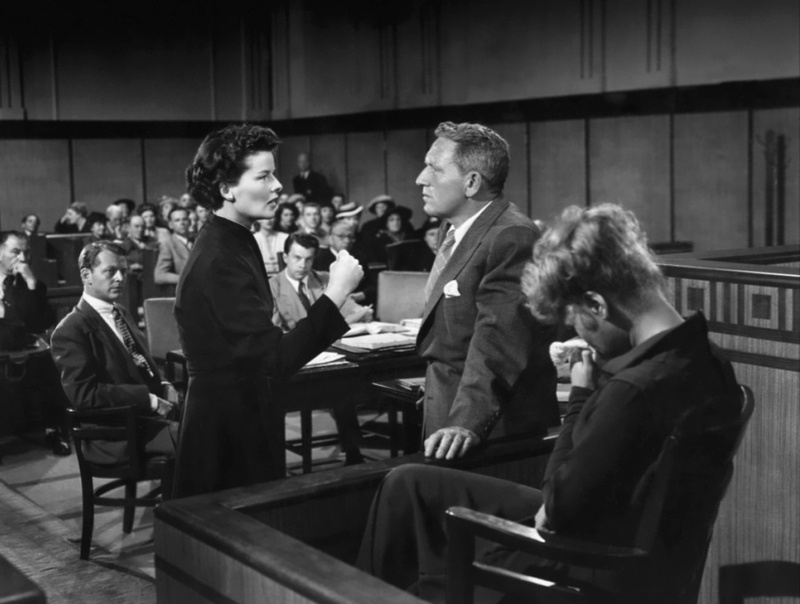 When he decides he’s had enough and tells her he hates it when she gets “all cause-y,” it’s the last straw, and she offers her services as a defense attorney to Mrs. Attinger. One thing I loved about the film was how well Tracy and Hepburn were able to convey their physical tenderness toward each other even when they were arguing. 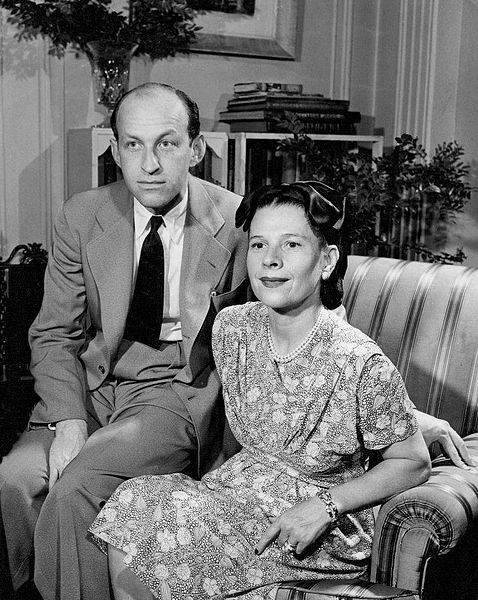 The Bonners are an extremely believable married couple, which is rare to see in the movies. 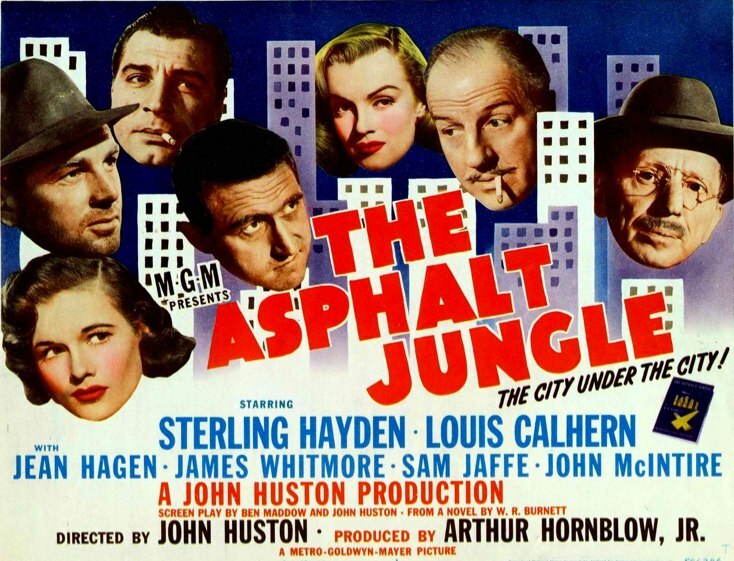 The supporting cast are all good, although David Wayne’s performance as the Bonners’ amorous across-the-hall neighbor was a little campy and over-the-top for my taste. 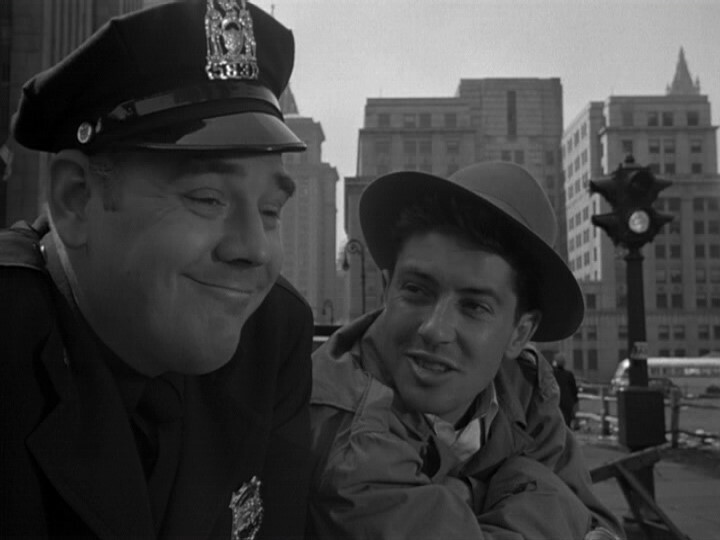 Still, this is a great film, and a truly funny and highly literate comedy. 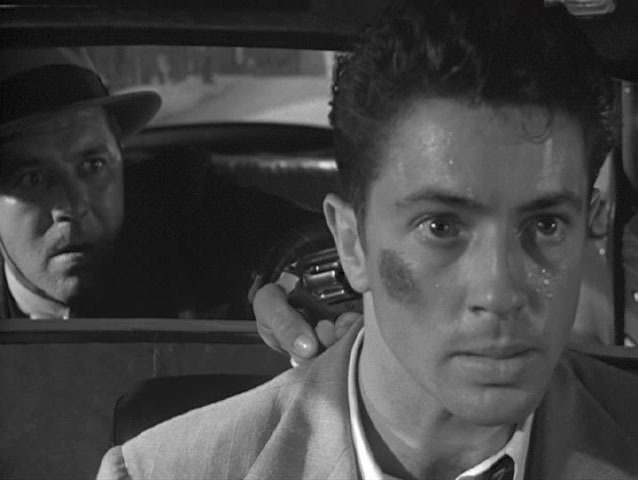 Adam’s Rib is a sure bet for my list of the best films of 1949. Posted in 1949, November 1949 and tagged Comedy, Garson Kanin, George Cukor, Jean Hagen, Judy Holliday, Katharine Hepburn, Metro-Goldwyn-Mayer, Ruth Gordon, Spencer Tracy, Tom Ewell. Bookmark the permalink.